This DVD introduces you to the best birdwatching sites in The Gambia and gives you a real ‘feel’ for what it’s like to go there. British birder, Dave Gosney, explores the Gambia, showing what the birding is like at 30 sites and giving you a chance to enjoy footage of the best birds: Egyptian Plover, Black-crowned Crane, African Finfoot, both Turacos, Four-banded Sandgrouse, Allen’s Gallinule, Verreaux’s Eagle Owl, Bateleur Eagle and many more. 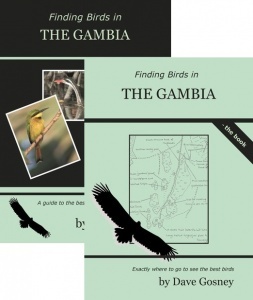 This is the most comprehensive and up-to-date guide to birding sites in The Gambia, not just the areas around the tourist hotels at the coast but also at many sites further afield and upriver. Banjul and the Bund Road, The Old Cape Road and Camaloo Corner, Kotu creek and pools, Fajara Golf Course, Casino Cycle track and Atlantic Road, Senegambia and Bijilo Woods, Brufut Woods, Tanji, Farakunku pools and Lodge walks, Tujereng ‘Woods’, Footsteps Lodge to Sanyang Pools, Marakissa, Kartong Sand Mine and Bird Observatory, Abuko Woods, Pirang, Makasutu, Mandina Ba and Farasuto forest, Faraba Banta Bush track, Jinack island, Tendaba, Kiang West, Soma wetlands and Kampanti, North Bank including Ka-urr. Panchang and the waterholes, South Bank from Brikama Ba to Bansang including Kunkilling, Jakhaly rice fields, MacCarthy Island including Bird Safari Camp. •Provides exceptionally detailed maps - so you can easily find your way around.